After celebrating it's first birthday a matter of weeks ago it was about time I got myself down to the 'Gold Coast' to see for myself if the hype is real. 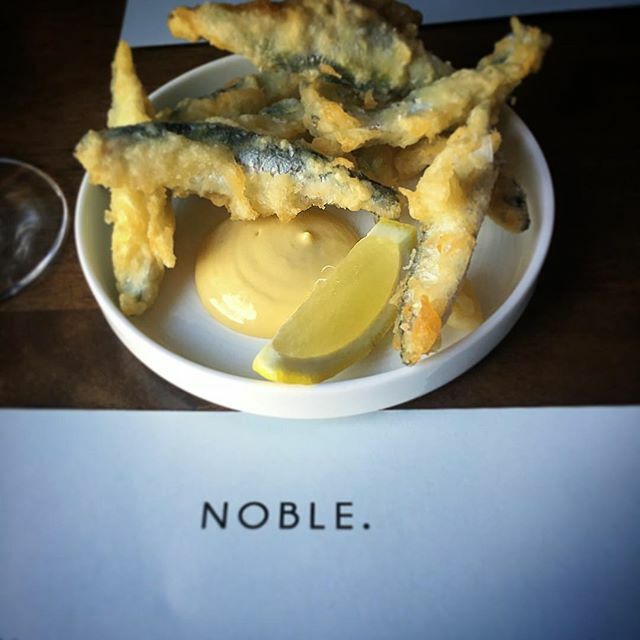 Noble, the brainchild of Pearson (Head Chef) and Saul (Front of house) both formerly of Deanes has fairly quickly become the gastronomic destination in Holywood. Upon arrival, up a set of narrow stairs, you are met head on with the kitchen getting a glimpse of service in full flight. The dining room is compact but the atmosphere is such that you aren't in those slightly awkward situations where you fell like the next table is listening to your every word. The comfortable back ground hum of modern house music emphasised the buzz of a service in full swing on a Saturday night. Saul, a former winner of the best restaurant manager in Ireland, is undoubtedly one of the best in the business with a knowledge of wine that I suspect would put many aficionados to shame. Upon being seated we were given a glass of Champagne and a couple of portions of fried whitebait with Aioli from their snack menu. Rachel, or Champagne Sally as she is regularly known was extremely impressed by this being somewhat particular about her sparkly wine in that she only drinks Champagne-not a cheap date. The whitebait was fried in a light batter that provided crispness complementing the freshness of the fish and the tangy aioli. Every meal should begin with Champagne and fried fish! The menu instantly impressed with 5 starters and 4 main courses plus a number of specials highlighted on a ginormous chalkboard. I'm all for restaurants perfecting a small number of dishes rather than taking a stab at an over ambitious menu. To start I was aiming for the Langoustines which are one of those menu items that if available I always order. However as a special we were informed that only one portion remained before ordering. Being the gentleman that I am I let the rest of our party order first. However, the odds were in my favour knowing out of our party of four one was pregnant and Champagnes Sally has an aversion to manually extracting the meat. So I only had to hope my pal Paul's starter did not begin with an L.
As luck would have it he only went and bloody ordered them, fell at the last hurdle! I wasn't too disheartened however with the promise of stealing one and the crab also sounding highly appealing. All good. The presentation of the crab starter was simply astounding with the combination of the crockery and food placement as good as you would see in any Michelin listed restaurant. My crab dish reminded me of a Thai salad with the delicate crab brought to life by a hint of ginger, chilli and fresh coriander. The peanuts added crunch and saltiness that rounded of a great little starter. 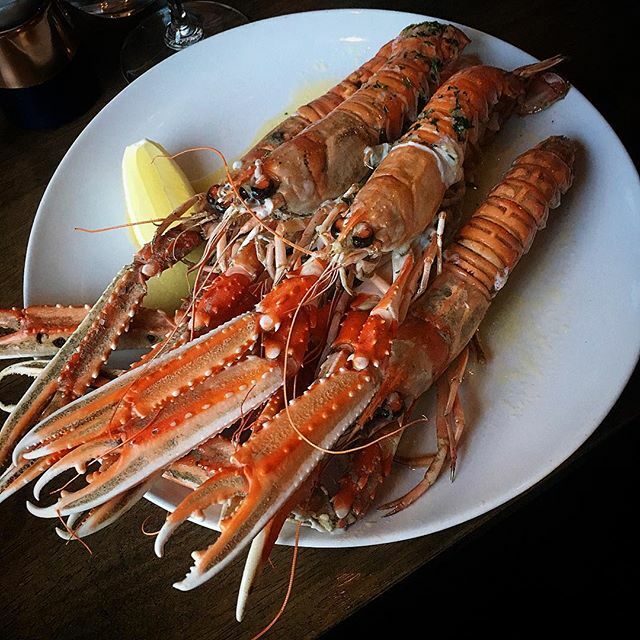 Oh and the missed langoustines where unfortunately incredible. Supplied by Still Waters Fish from Portavogie they tasted like they were straight from the sea. Super sweet, melt in the mouth with a rich buttery dipping sauce that only further enhanced their sweetness. Damn you Paul. For main course I was torn between the rack of lamb and the ribeye steak. It wouldn't be amiss for me to say that I know how great Hannan's salt aged lamb and beef are meaning it was a coin flip between the two. I ordered the lamb, then changed my mind to the Ribeye. 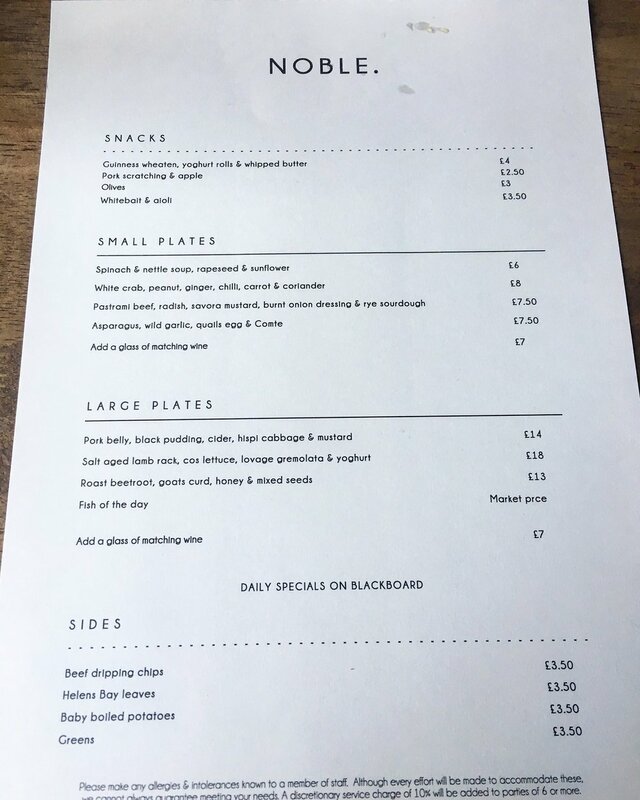 It's so hard for me to get away ordering a ribeye especially when the specials menu cites beef dripping chips and peppercorn sauce. Plus Paul ordered it too and I couldn't suffer dish envy two courses in a row. What arrived ticked all the boxes. 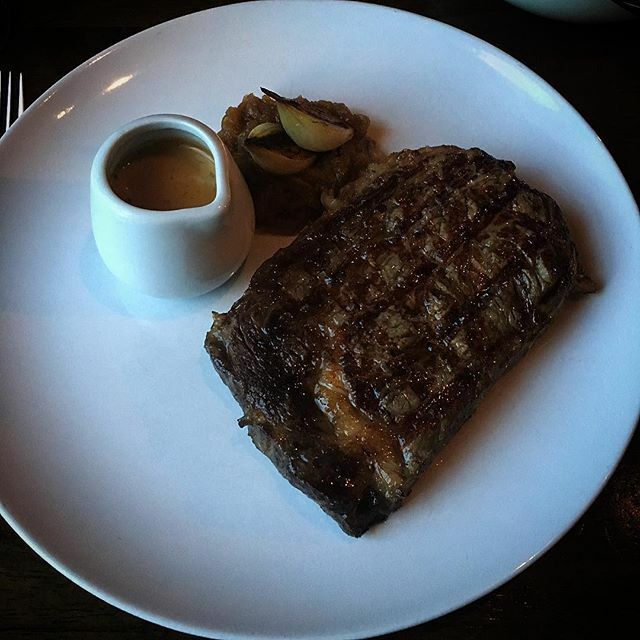 Cooked rare ✓ , caramalised ✓ , well rested ✓ with crispy beef dripping chips and a punchy pepper sauce. Another example of letting excellent produce speak for itself. The richness of the beef was complemented by a bold Tempranillo (Dehesa La Granja) recommended by Saul, a match made in heaven. I decided against a dessert due to the gluttony of my steak and chips but instant regret set in once I tasted Rachel's Brioche Bread & Butter Pudding with Banana and pop corn ice cream. Saul & Pearson told me they place as much importance on dessert as the rest of the menu and this dish certainly proved that. Think of a banana bread and butter pudding that was both light and rich with an instant hit of banana. The popcorn ice cream provided a nutty back ground flavour which could have been served as a dessert in itself. I probably should mention that I have known Saul for many years and if our meal turned out to be a disaster this review wouldn't have seen the light of day. Unsurprisingly that was far from the case. They have created an excellent little destination in Holywood and I suspect it's not only the folk from North Down frequenting the restaurant. I was told that Michelin paid their first visit last week meaning it's now on their radar so here's hoping Noble can add to their recent Irish Restaurant Award's in future. 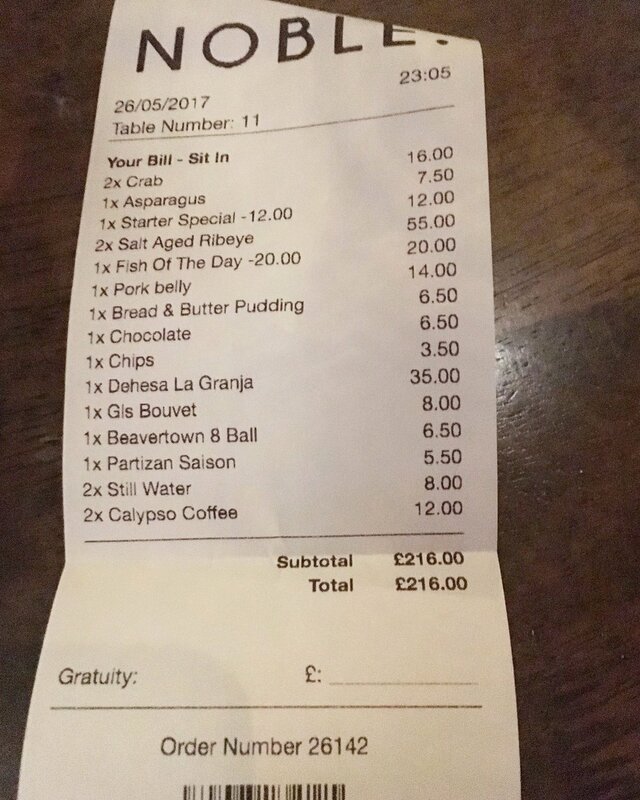 Price wise the bill came to £216 for four people. At £60 a head including tip I think you would struggle in finding a comparable experience at that price point.